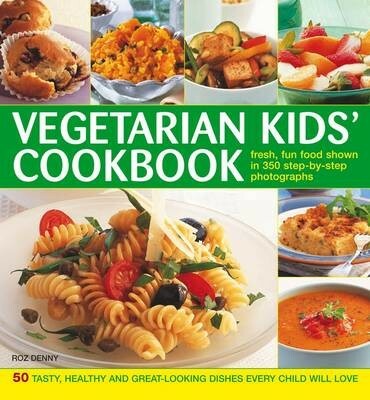 Children will love this collection of over 50 irresistible and healthy recipes, which range from soups, snacks and light lunches to main meals, side dishes and desserts. It features specialist advice on the best foods to feed your vegetarian children, and useful meal planners to help you balance their nutritional needs. It includes all the traditional favourites including Chili Cheese Nachos, Spicy Spuds, Fruity Coleslaw, and Blueberry Muffins. Simple step-by-step techniques show how to make cooking easy and fun, and there is a beautiful colour photograph of the finished dish to ensure perfect results are achieved every time. It features cook's tips and variations to inspire and encourage experimentation. Full of many wonderful dishes to please even the fussiest of appetites, this exciting collection will help you prepare vegetarian versions of all-time favourite dishes that will appeal to all the family. There are dishes to suit all seasons and occasions, from wholesome soups for the winter to a tasty Chunky Cheesy Salad for the summer. There are also more substantial meals, such as Bean Burgers and no children's recipe book is complete without desserts, which range from healthy fruit salads and Strawberry Smoothies to richer bakes such as Carrot Cake or Blueberry Muffins. Helpful expert advice will keep you well-informed about what you are feeding your children. Over 350 stunning colour photographs and step-by-step techniques help you prepare each dish, making this a truly useful guide to creating the most delectable dishes for all members of the family.